When Primal Therapeutics first started we tried every topical we could get out hands on. There were only a few that were worthy of our patients. We needed topicals that would be good for a variety of skin disorders and types of pain as well as be viscous enough to apply to the entire body. As the years went by our desire for a better product increased. We are excited to announce you can now buy the products designed for our patients! Visit our SHOP here. The more time we spent working with our patients learning about different disorders that we would be helping with the more we craved research about other herbs that can be used as plant medicine in our topicals. After several courses in herbalism we began to formulate our products. Using friends, family and regular clients as our test subjects we experimented until we received enough positive feedback that we had found the recipe we were looking for. We currently have four topical products available. Our salve is called Primal Salve-Vation because it will become your salvation. It provides relief to countless conditions. Our herbal body oil is excellent for dry skin especially after a bath it glides over large surface areas. 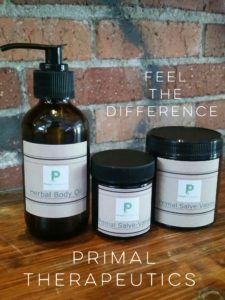 Primal Soak & Scrub can be used in two ways: as a scrub to your face, feet or anywhere that needs extra TLC or add a couple tablespoons to your bath for total relaxation. Last but not least we have Velvet Balm’s. They work like lotion bars, simply hold it in your hand and rub over the skin and feel your body melt and become soft like velvet. Topicals are an incredible way to learn more about the power of plant medicine. If you have any questions about our products or would like to place a custom order please email us at: primaltherapeutics@gmail.com.